This blog has become my ATM build and observation diary. I have built several telescopes, a large, equatorial mounting and a raised dome on an octagonal building. Images are now kept small to cater for slow connections. [Click!] I sometimes deal with building solar telescopes. Which are potentially very dangerous! I can accept NO responsibility for any action not directly supervised by myself. You are NOT entitled to blame any other person for your OWN lack of skill or complete ignorance. My GOTO slews within C-Du-C, IH2 Home and Park are all complete and utter nonsense. No matter how often I Sync on the Parking position, or on the Sun or Moon, the system cannot move reliably to another object. I thought the Local Sidereal Time might be off so I used online calculators to confirm. No problem there. Accurate to within a couple of seconds of the reading on the IH2. 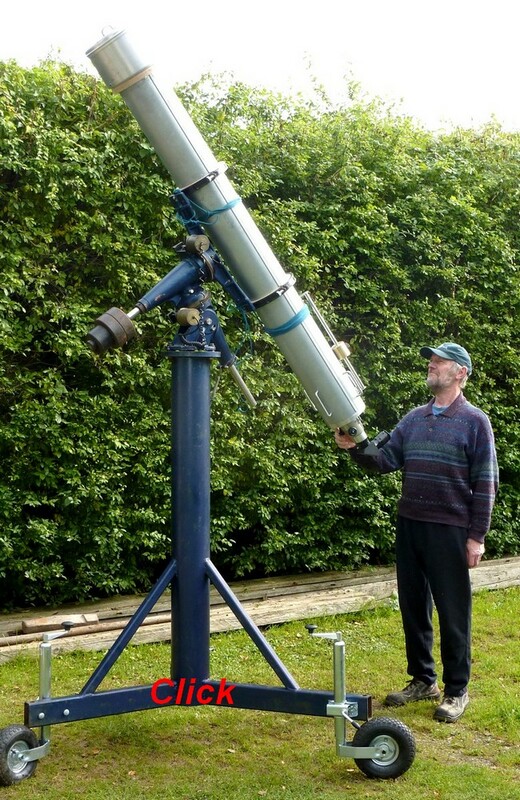 I always park the telescopes horizontal and pointing east, weights down. Every single time I have to drive the telescopes there using either paddle on closing down. Using Home will never find the parking position. Perhaps once during my entire use of the system. Starting each observing session I take LST from the handset then add 6 hours and enter the Sync coordinates on the parking position. Then add Dec as 0° 0' 0". I then repeat the same operation in C-Du-C. Syncing on an object on the eastern horizon before attempting any telescope slews. I check the bottom line in C-Du_C for the correct Altazimuth coordinates and RA Dec match. Having checked the main tube of the 7" is truly horizontal with a builder's level I then press SETPK. [Set park] What could possibly go wrong? Remember that the telescope hasn't yet moved so you'd think I could press SETPK again just to confirm. But no! Not calibrated! It is supposed to have remembered the parking position from last time! So I calibrate again and then press SETPK. Completed. Only then can I click on the Sun in C-Du-C and "Slew to." If it ever arrived on the Sun I would hold a neighbourhood party to celebrate! It always overshoots by miles and ends up at completely the wrong altitude. So I drive the telescope back to point at the sun using either paddle and then Sync on the sun in C-Du-C. Knowing the coordinates I can now Sync the Sun on the AWR IH2 handset. Just in case. Now try pressing Home to have it park? Always garbage/random positioning! So I lay a 2m long builders straight edge against each base fork tine in turn. With the free end resting on the dome's roller ring to confirm it is all north pointing. While being careful to avoid any iron in the vicinity I [gently] adjust the azimuth with a scaffolding pole. It is massively heavy! I just rechecked the easterly horizontal position, weights down, Synced on the IH2 and was greeted with "Perimeter Exceeded!" So now I can't even Sync on the parking position! So I go through all the Syncing rigmarole again and it accepts it. I hit SETPK and it accepts that too. But for how long? The madness goes on: Having just confirmed that both AWR and C-Du-C were showing parked I sent the telescopes to Polaris. It seems Polaris is now 20° east of its known position! Should I confirm this change with the astronomical authorities and claim my Nobel Prize for Physics? Or should that be astrology? Having moved the telescopes to the traditional position over the polar axis I pressed Home for park. The polar axis started turning and resolutely headed west. The 7" objective is now staring down at the floor of the observatory towards the north east. That is only two movements and both slews were to completely the wrong target! The Polar Axis need not have turned AT ALL in both cases. So it was just a simple Declination slew. When I closed down the Altazimuth readings were shown on the IH2 screen. There too were complete and utter garbage! Now, where do I enter "Garbage" for the next target! 21st April 2019 H-alpha experiments. 15th and 16th April: Imaging the moon and sun. FTF3545 custom base ring machining. Custom Base Ring for 3.5" FTF 3545B-A focuser. Tuesday 9th April Solar imaging woes. 8.04.19 Solar Neximage5 and UPS problems. April 1st NASA finally admits The Sun is flat!